Remember when Beth Dunn and I dreamed up that handmade gift drive for local women and kids last year? Well, we're at it again! 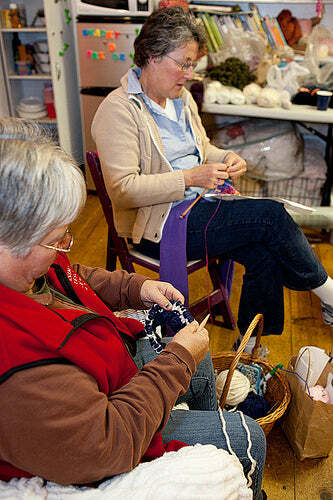 Handmade for the Holidays is an annual holiday charity crafting event in which we invite folks to create hand-knit (crocheted, sewn, etc) items for donation to local (Cape Cod, MA) women and children in need. The idea is: warm, soft, cozy things. You know, things that convey love and comfort. As of November 1, we are accepting hand-made (new, please!) hats, scarves, mittens, blankets, and quilts (etc). At this point I think we have enough yarn donated, but we could still use knitting needles! This year we are again partnering with local nonprofit WE CAN and now The Family Pantry, who will ensure that the items go directly to needy women and families in time for the holiday season. Last year we had a couple evenings of crafting together here at my shop and it was so fun that this year we are going to have several! Craft Nights at Yummy Goods will be Wednesday nights from 5-8 until the wrap-up party on December 8. 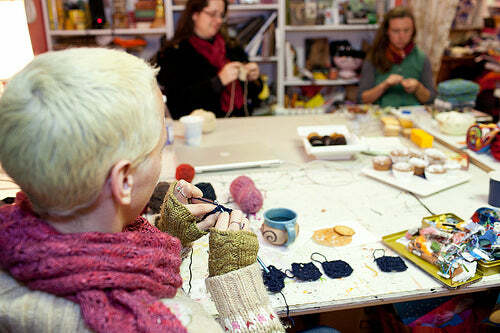 Join us in a community atmosphere to work on your Handmade for the Holidays donation! We have hot cider and cookies. You know you want some. Yes, that's my little blonde head. I am making a granny square scarf. While wearing mitts and a scarf made by my fiend Beth, who is seated across from me. New Cindy was concerned because she doesn't knit or anything and isn't really interested in learning. I said she could come and eat cookies as her craft, so she did. She is really good at it! Seriously, it's as much about hanging out with cool women and eating cookies as it is anything else, so don't let limited skills stop you from joining us. And Beth and Suzanne are always happy to get someone started on a simple scarf you do want to learn. Unpictured but present and awesome: Stacey (linked above) and Michelle Law! And if you aren't close enough to join us in person, but would like to contribute, well of course you can! I have already heard from fellow crafters/bloggers Heather from Olive and Ollie and Ryan from Ryan Walsh Quilts, so go ahead and make something if you like! I just need to have it in my hot little hands by the closing party on Wednesday, December 8! Otherwise, locals: please join us or spread the word to your crafty friends if you can't!